Follower Lynn's Franken that I posted yesterday received such a nice reception, I thought I'd show you another one. I took close to a million pictures of this one, called Christmas Nightie, and only have one to show you. They all turned out about the same, but there seems to be too much going on with this shade for my camera to comprehend. This one coater (unbelievable!) 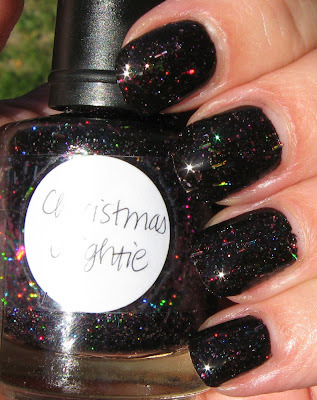 is filled with so many glitter shapes and colors, and they all reside happily on a black base. The glitter shows up on the nail much more than it does in the photos. 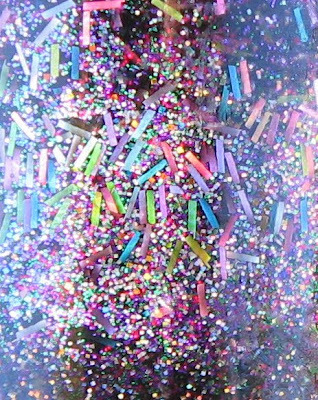 Below: This is a macro shot of Christmas Nightie in the bottle. Do you see what I mean about "too much going on"? In this case, "too much" is definitely not a bad thing! I just adore the colors that Lynn comes up with. She seems to have an uncanny ability to mix the best of everything together in such a way that a unique shade is born every time. I think I have one more "Lacquer Fashions by Lynn" polish to show you, which I'll do yet this week. See, I already came up with the name of your line for you Lynn...Lacquer Fashions by Lynn! Let us know when you start up the production lines! Oohhh i'd totally buy this! LYNN, WHEN YOU RELEASE YOUR LINE, RELEASE SOME IN IRELAND PLEASE! Gorgeous! I'm with the others; I'd totally buy it. I'd also by this, it's amazing!! this girl seriously makes the best frankens EVER! she should sell them! I am totally taken by that one! The colors are amazing! I definitely agree...she needs to sell those suckers. I'd buy. Yes, Lynn should sell these! Gorgeous creations. Thanks for sharing! Lynn I want two bottles of that beauty! That's beautiful on you Mary. I adore the name also. That could be a Honeymoon Nightie! 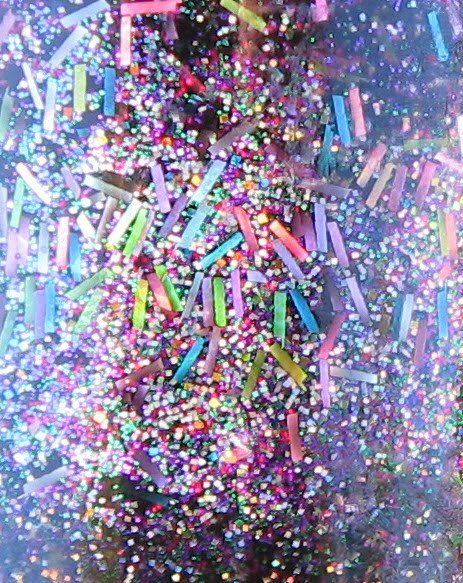 The amount of different colored and sized glitters are amazing. Maybe Lynn could do a few posts on your blog. LOVE this franken! Lynn is a talented mixologist, hehe! What an awesome gift!